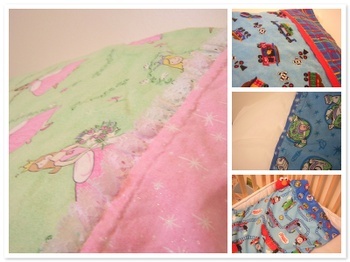 Intro: So, here is a tutorial for how to make pillowcases. Pretty ones, with 3 different fabrics. My mom taught me how to make these, her friend taught her, not sure where the original idea sprang from, but this is how I do it. The good thing about them is that they make great gifts. They are very mail-able - you can fold them into a little padded envelope. Throw some candy in with it, and it's a great gift for a college kid or niece/nephew. They're also good for small gifts for nieces, etc. for Christmas or to send to birthday parties. My mom originally made them with holiday themes for my sister in college, and then my daughter: St. Patrick's day, Easter, Halloween, etc. Again, cute for college kids, as they don't always have decorations for holidays (esp. the 'lesser' holidays). She would put them in holiday packages for my kids when they lived far away. The fabrics can be as 'loud' or as subtle as you want, it's kind of fun to make them out of the novelty or character fabrics (as what else are you going to do with those!). Most of the ones we have are ones my mom has made for the kids - but I have been wanting to make some plain cream colored ones with plum trim to match my (someday finished) quilt. Scroll down to the bottom for more examples, ideas, and a downloadable instructions page! Yardage: (from a regular 44-45" bolt) I looked up the Metric equivalents, so I hope this makes sense! 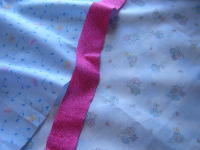 I am using the pillowcase I included for Jo's daughter for the Vintage Button Swap as an example. 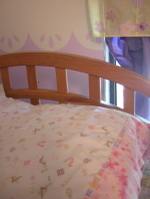 the print on the left is the border, the pink is the trim, and the floral on the right is the main piece. Yeah, not ideal to have two blues for a tutorial, but I think you'll be alright! So, first, trim all your pieces. They don't have to be exactly a certain size, but trim the edges so that they are even. The main piece should be about 27 x 42", the border 9" wide. Iron your trim in half, lengthwise. Place the border right side up. On top of the long side, place the main piece of fabric right side up. On top of that place the folded trim strip with raw edges even at top. Stitch through all layers (1/4 " seam allowance). Open out the border. Press seam towards the border. Press under 1/4" on the edge of the border, and then fold border in half and press. Make sure that the folded edge of the border is over the seam line (pin if necessary - but generally I'm not a pin person - it works fine without). Topstitch close to the folded edge. Fold pillowcase in half, with right sides together. (You can do a french seam here, but I choose not too). Stitch 1/4 " around the side and bottom. Serge or zig-zag around the edges to finish. Flannel pillowcases for winter (my kids each have a flannel 'everyday' one and a flannel Christmas one) - when making flannel ones my mom has omitted the trim. I think it would get all bunchy - so it's probably a good idea.